On April 17th, LSC was honored to co-host a White House forum on the state of civil legal assistance. The two-hour event featured spirited discussion by a diverse group of national leaders and directors of LSC-funded legal aid programs. In his remarks at the forum, President Obama said that making civil legal assistance available to low-income Americans is “central to our notion of equal justice under the law” and pledged to be a “fierce defender and advocate” for legal services. Other speakers included U.S. Attorney General Eric Holder, former Pennsylvania Governor and U.S. Attorney General Richard Thornburgh; Deputy Chief of Staff to the President Mark Childress; U.S. Department of State Legal Advisor Harold Hongju Koh; Justice Jess H. Dickinson of the Mississippi Supreme Court; Department of Veterans Affairs General Counsel Will A. Gunn; White House Counsel Kathryn Ruemmler; Senior Advisor to the President Valerie Jarrett; Illinois Attorney General Lisa Madigan; American Bar Association President William T. Robinson; and Harvard Law School Dean Martha Minow, who is also vice chair of the LSC board. The forum looked at the critical role of civil legal assistance for the poor in fulfilling the promise of “justice for all” and in maintaining America’s commitment to the rule of law, two nonpartisan issues that are fundamental to our way of life. Society of Cleveland, John Whitfield of Blue Ridge Legal Services and Cesar Torres of Northwest Justice Project participated in a panel moderated by LSC President James J. Sandman. They discussed the state of civil legal services in their service areas and how they use partnerships with pro bono attorneys, technology, and other innovations to leverage scarce resources. See coverage of the forum, including videos and photographs of the event, and links to transcripts of several speeches. On May 10th, after turning back two amendments that would have further cut or eliminated funding for LSC, the U.S. House of Representatives approved a Commerce, Justice, Science (CJS) appropriations bill that provides $328 million for the Corporation in Fiscal Year 2013.
n opposition to both amendments. Reps. Norm Dicks (D-Wash.), Jose Serrano (D-N.Y.), Steve Cohen (D-Tenn.) and Bobby Scott (D-Va.) also took to the floor in support of LSC funding. Read more about the House legislation. Subcommittee on Commerce, Justice, Science, and Related Agencies (CJS) approved legislation that provides $402 million for LSC in Fiscal Year 2013, which is what the White House had recommended. The full Senate is expected to consider the CJS bill in June. Read more about the Senate legislation. 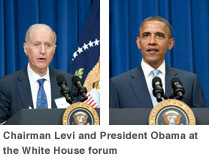 The White House forum was the high point of several days of LSC activity in the nation’s capital. The week also included a meeting of the LSC Board of Directors (April 15th & 16th) and a meeting of LSC’s Pro Bono Task Force (April 17th). At the board meeting, President Sandman highlighted 2011 data received from grantees, the Technology Initiative Grant (TIG) program, implementation of recommendations made by the Fiscal Oversight Task Force, a grant from the Public Welfare Foundation and a new public service announcement campaign. 2011 Grantee Data: Sandman reported that LSC-funded programs closed 899,800 cases in 2011, a decline of 3.6 percent from 2010 and in line with funding reductions for the same period. (Funding in 2011 from all sources declined by 2.8 percent as compared to 2010, including a 3.5 percent reduction in funding from LSC.) Total staff numbers decreased by 6.7 percent during the same period. He also reported that pro bono cases as a percentage of total cases closed in 2011 rose to 8.8 percent from 7.6 percent in 2010. TIG applications: LSC received applications from 49 programs in 34 states, including five first-time applicants. Fiscal Oversight Task Force: Implementation of the Task Force recommendations has begun. Action to-date includes: revisions to the field grant application for 2012 to request specific fiscal control information; more formal involvement of the Office of Compliance and Enforcement (OCE) in grant-making decisions; more frequent meetings between LSC management staff and staff of the Office of Inspector General; work on consolidating and expanding access to all LSC grantee data; and the recruitment process for a vice president for grants management. Public Welfare Foundation Grant: At the completion of work supported by a planning grant from the Public Welfare Foundation, LSC was invited to apply for a second grant that will fund work to improve the collection, analysis, and use of data from grantees. Public Service Announcements: LSC recently began a new public service announcement (PSA) project designed to help its grantees build visibility in their local media markets. The PSA is a 30-second video spot customized for each program. A pilot phase involving 20 programs is currently underway, and initial feedback has been very positive. Ultimately, all grantees will have the opportunity to take part. See the public service announcement. Read transcripts of the April 2012 board meeting. Mullahy-Fugere told the committee that from the provider perspective, “We have a very different landscape now than we did before the Commission was created. D.C. has been blessed to have a very rich tradition of pro bono, and we have a very strong legal services network. But we never came together in the same kind of strategic way that we're able to do now around the table of the Commission.” The Commission provides an opportunity for providers, firms and others to come together as equal partners, she continued, “which is something that, as a provider sector, we really didn't have” before the Commission was formed. One of the major accomplishments of the Commission, Marks said, has been to significantly increase financial support from law firms. “Our private bar is very generous, pro bono and financially,” but “everyone wants to have some kind of a measure.” They want to do the right thing, but they want to know what other firms are doing. Marks explained that the Commission collected data on how much the most generous firms were giving and used it to establish benchmarks for future giving. In 2011 the Commission launched “Raising the Bar,” an initiative that asked law firms to pledge to give at one of three benchmark levels. Twenty three firms gave $3 million to legal services in D.C., which was $500,000 more than in the prior year. One of the Commission’s goals for 2012 is to at least double the number of participating firms. The panel covered other topics, including pro bono, the role of judges on the Commission, language access and working with the city council to increase public funding. Read a full transcript of panel discussion. Visit the DC Access to Justice Commission website. The Rural Working Group identified two priorities for successful pro bono in rural areas – involvement of the judiciary and private bar “champions,” and robust support for private attorneys. The group emphasized that these priority areas should work together and become mutually supporting. pro bono, including lack of awareness of the need (considered to be the greatest obstacle) and insufficient support. The group also proposed solutions, such as increasing awareness of the justice gap; offering a range of pro bono opportunities to match need with the interests and abilities of private lawyers; and developing leadership that supports private attorney involvement, allocates needed funds and ensures the pro bono program manager is skilled and well-respected. The Urban Working Group identified specific steps LSC can take to improve the pro bono sector, including creation of a pro bono innovation/incubation fund. The group also recommended that courts actively promote law firm engagement in pro bono by setting specific standards that warrant recognition by the courts, and that private firms, corporations and bar associations provide financial resources as well as volunteer attorneys to support a collaborative pro bono infrastructure that is integrated with LSC grantees and other legal aid providers. Design and implement a public relations campaign to raise awareness within and outside the legal profession about the continuing crisis in legal aid for the poor, recruit members of the bar to take on pro bono matters, educate key policymakers and prospective donors on the importance of funding legal aid and celebrate the work done by legal services lawyers. The Technology Working Group identified four areas in which technology can be applied to promote and support pro bono: adopting best practices such as case management systems optimized to support pro bono, automated forms and use of mobile apps; facilitating integration and centralization for both attorneys and clients; providing and ensuring support for pro bono attorneys; and encouraging innovative approaches, including providing opportunities for non-lawyer volunteers. The working groups’ findings and recommendations will be incorporated into a report of the full task force and released later this year. Thomas A. Fuentes, a former member of the board of directors of the Legal Services Corporation, died May 18th in Lake Forest, Calif. He was 63. Appointed by President George W. Bush, Fuentes served on the board from 2003-2010. 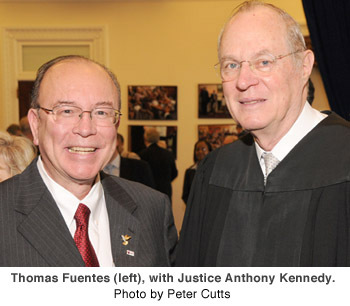 Fuentes’ service to LSC is just one of many examples of his work in the public sector. He was perhaps best known for his tenure as chairman of the Orange County (California) Republican Party from 1985 – 2004. In addition to helping found Second Harvest Food Bank, he served on both the Board of Advisors of the United States Elections Assistance Commission and the South Orange Community College District Board of Trustees. Fuentes was a senior fellow with the Claremont Institute for the Study of Statesmanship and Political Philosophy and a director for Eagle Publishing Inc., in Washington, D.C. A devout Catholic, he was communications director for the Roman Catholic Diocese of Orange from 1977 to 1989. Fuentes is survived by his wife, Jolene, and three children. LSC recently welcomed new Director of Government Relations and Public Affairs Carol A. Bergman and new Dire ctor of Media Relations Carl Rauscher. Bergman will oversee LSC’s relationships with Congress, the Government Accountability Office and other government agencies. Prior to joining LSC, she was deputy executive director of the Global AIDS Alliance. Her more than 25 years of experience in the federal government and non-profit sector includes service as associate counsel to the U.S. House of Representatives Committee on Government Operations and as director of legislative affairs for the White House Office of National Drug Control Policy. She began her career as director of a program for abused women and their children. As director of media relations, Rauscher will lead the organization’s communications activities. He came to LSC from the American Bar Association, where he was deputy director of communications and media relations. His more than 30 years of experience as a journalist include serving as news and politics editor for Cox Newspapers’ Washington bureau, as Washington and politics editor for the Atlanta Journal-Constitution, as executive editor of the Fulton County (Georgia) Daily Report, and as a news editor for CNN. The Washington Council of Lawyers (WCL) issued a report in May assessing the current status of civil legal aid to low-income families in light of the nation’s recent economic challenges. The Google Translate API, which allows developers to incorporate Google's translation capabilities into websites, online applications, and other software. 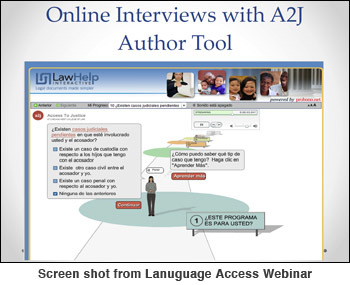 View the webinar and learn about other TIG-funded projects that address language access. The LRI website promotes the sharing of innovative and best practice materials within the legal services community. New content is added every month. Learn more. LSC’s new Grants News email list is a great way track information and deadlines notices related to the competitive grants process. Learn more and sign up. Womble Carlyle and Legal Aid of North Carolina have joined together on a pro bono project to assess the legal needs of Hurricane Irene victims still struggling with insurance claims, construction scams, mortgage-related problems and other relief issues eight months after the storm made landfall last August. A cross-section of South Florida's new poor gathers each weekday morning in the lobby of the Legal Aid Service of Broward County, bringing with them a wealth of woes and a little bit of hope. Washington Post coverage of a growing trend among corporations toward creating more structured programs for attorneys and legal staff to do pro bono work in partnership with legal services programs. Georgia Legal Services Executive Director Phyllis Holmen's reflections on the experience of sharing her program’s story as part of the White House Forum on the State of Civil Legal Assistance.